An MP who fought to save the life of PC Keith Palmer during last year's Westminster terror attack has told an inquest how a doctor ordered him to stop giving CPR. 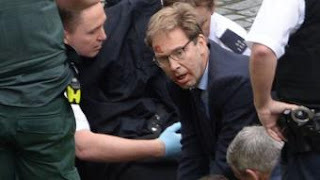 Tobias Ellwood rushed to help PC Palmer after he was stabbed by Khalid Masood on 22 March. But a doctor told Mr Ellwood, "you've done your best", and PC Palmer died. After almost breaking down in court, the MP said: "[We] closed the eyes and then I said 'I'm sorry'." Mr Ellwood said that if he had taken his normal route into Parliament, he would have been closer to Masood as he launched the attack. "I know I would have stepped forward and I regret not having the opportunity to do so," he added. Four other people died after Masood drove into them on Westminster Bridge. The inquest into the deaths of PC Palmer, 48, Kurt Cochran, 54, Leslie Rhodes, 75, Aysha Frade, 44, and Andreea Cristea, 31, is taking place at the Old Bailey in London.